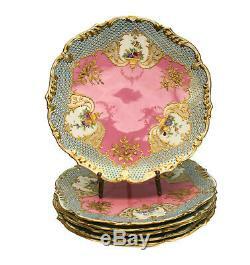 Description: There is no way to overstate how fine and stunning this set of 6 Coalpoart cabinet plates are. Hand painted porcelain with scalloped rims cabinet plates, 19th Century. 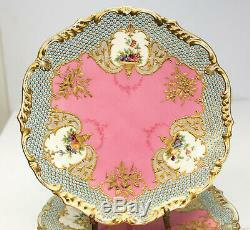 Exceptional gilt encrusted flowers around the rim of the pink centered ground. Hand painted floral bouquets and blue enamel dots throughout. 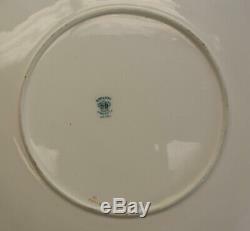 Coalport England mark to the underside. 9.1 inches diameter Condition: Excellent age related condition. Very light surface marks to the gilt areas and minute wear to the pink ground on some plates. Please view our selection of quality items. For sale at Gallery XV! We possess over 100 years of experience in the industry as collectors, appraisers and resellers. Our ever expanding inventory originates from estates throughout the U. But is especially rich with Southern California estates including celebrities, historical figures and renown collectors. If you haven't seen something that interests you or that you collect, stay tuned... It's just the tip of the ice berg. We are prompt and professional with our correspondence and appreciate you taking the time to shop with us. "You are only as good as your last feedback". The item "6 Finest Coalport England Hand Painted & Enamel Porcelain Cabinet Plates c. 1890" is in sale since Friday, March 29, 2019. This item is in the category "Pottery & Glass\Pottery & China\China & Dinnerware\Coalport". The seller is "gallery_xv" and is located in Gardena, California.